I hope you're enjoying December so far! Can you believe that it's less than three weeks until Christmas?! (And in my case, I'm doubly excited for my birthday too!!). I am a massive Christmas lover, so this is the time of year where time inevitably feels like it's standing still as I'm so excited for Christmas to get here! 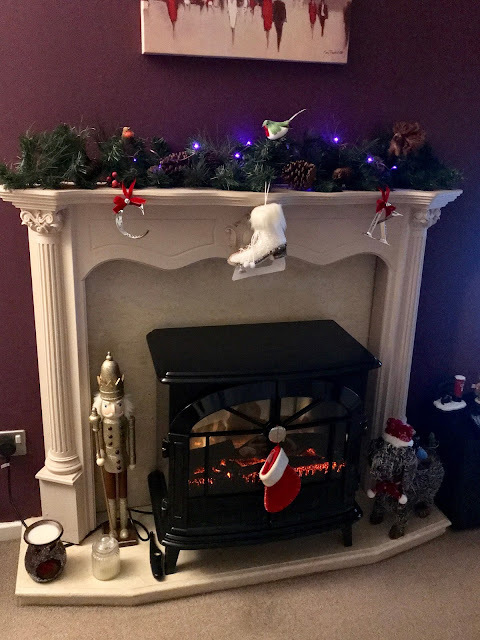 Today, I thought I'd share my Christmas decorations on Coco's advent, and tell you all about how I incorporate my two favourite loves, fashion and Christmas, this time of year. So settle down and enjoy peeking behind the door of Day 5! I'm sure I've shared some Christmas decorations on Coco before, maybe a good few years back, but it's been a while anyways so forgive me if you're suffering from a case of deja vu whilst reading this! I have a confession to make, I am an extreme bauble hoarder/collector. Everywhere I go at Christmas I always pick up a bauble, meaning my tree has baubles of all shapes, sizes, colours and materials all carrying different memories of the places they came from. Being a fashion girl; I'm always drawn to any sparkly fashion garment I can hang from the tree, and I realised that this is my way of bringing fashion into Christmas! This beautiful glass dress bauble has been a firm fixture on my tree for a few years. I can't remember where I got it from but I fell in love with its detail, similar to my love of a good embellishment when I'm buying a beautiful dress in the real world! And what dress would be complete without a sparkly shoe to go with it?! I was just reading yesterday that sparkling shoes are all the rage this winter, so my tree is more fashion forward than it realises! I think I got this one from The Range a few years back. I collect Disney ornaments and usually buy a couple every year. You can't possibly get more glamorous than a Princess with a beautiful gown, and Belle is certainly ready for the ball in this number! Tale as Old as Time anyone? 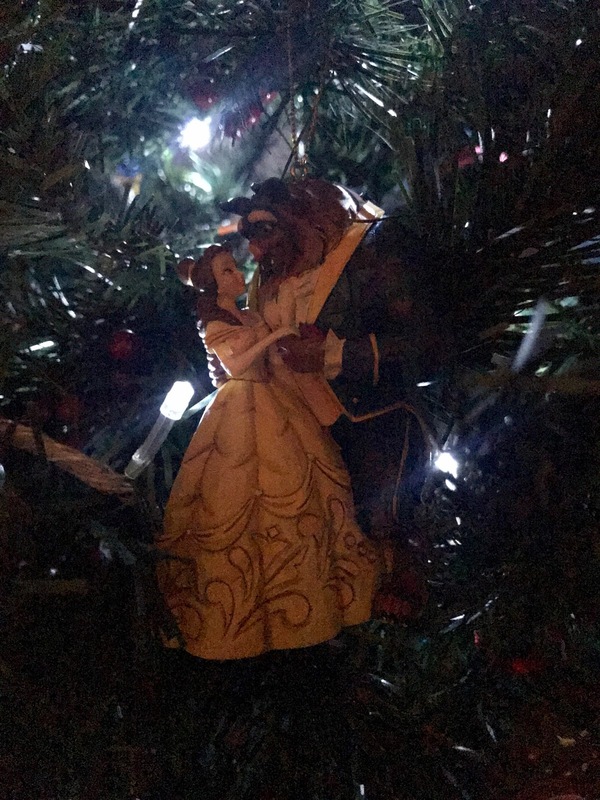 This beauty was an early Christmas gift from my lovely Mama Bear and is from the Disney Traditions range by Jim Shore (the Disney Store always have amazing baubles too!). 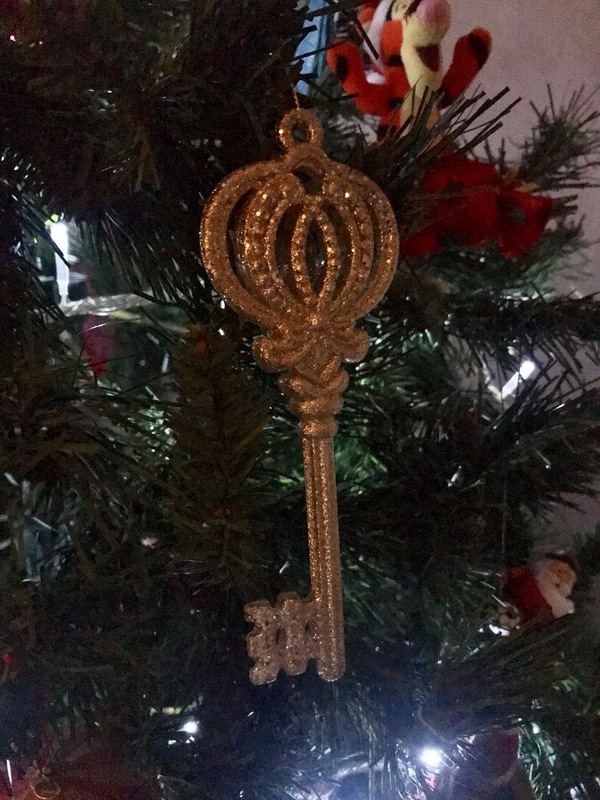 Every girl dreams of a blue box under the tree, but how about adding a key to rival Tiffany's to your tree decorations? Okay, so it may not be real gold, but it sparkles beautifully and might just drop the perfect subtle hint to your beloved; you're welcome! This stylish ice-skate caught my eye in the Poundshop of all places! I think I may have paid slightly more than a pound for it, but I love the way it sparkles and catches the light! I only bought this recently, so if you like it and there's a Poundshop near you in the UK, you may be able to pick one up (I'd also grab a couple of their Gingerbread candles as well; they're sensational!). I know Christmas isn't about fashion, but isn't it nice to incorporate the things you love into this beautiful time of the year? I'm currently working on a way to display my Manolo's this Christmas...I'll get back to you with how I get on! How have you decorated your house this Christmas?